Morgan Siewert: On its face, your project to analyze expressive culture among Navajo country music artists using both ethnomusicological and linguistic anthropological methods seems daunting. However, your final product is a nuanced but informative and approachable ethnography using both music and language to locate country music as a site where Navajo identity is navigated and negotiated. How would you describe your book to someone unfamiliar with how seemingly Western expressive forms are used to perform Navajo authenticity? Kristina Jacobsen: My book is a situated story of one Anglo singing anthropologist’s journey into the rich, vivid and totalizing world that is Diné country western music and cowboy culture. Contrasting our stereotype of “cowboys and Indians,” Indian people, and Diné people in particular, have long identified as both “cowboy” and “country;” the affinity seems natural to many Diné people I know, so much so that it barely bears explaining. 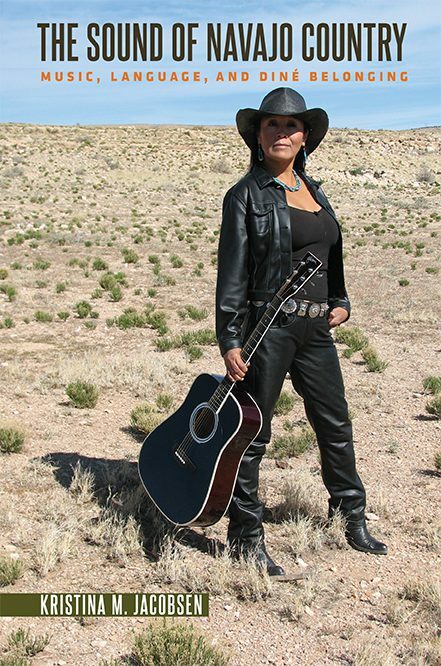 Country songs are often about dispossession, loss, nostalgia, tradition, relocation and the centrality of kinship and family: these same themes are themes that resonate very powerfully with my Diné interlocutors, both through the performance of country music and through participation in rodeo. Morgan Siewert: On page 21, you write, “I understand the speaking voice as being equally central as the singing voice in illuminating the nuance of Diné politics of authenticity and belonging.” This is a succinct illustration of your use of ethnomusicology and linguistic anthropology to bridge disparate approaches to the concept of “voice.” Could you elaborate on the significance of complicating “voice” in your book? Kristina Jacobsen: In song and in the songwriting world, there is a heavy focus on lyrics and on the text; what does the song say, what is being signified through the lyrics, what can we infer about the identity of the singer through the performance and voicing of the song, how do we shape the listener’s experience through a tightly-crafted song? This is also true in ethnomusicology and in popular music studies, where often the focus is exclusively on the lyrics of a song and where the lyrics come to stand in for/represent “the song.” In linguistic anthropology, the emphasis is also often on text, or what has been transcribed in the form of discourse analysis or ethnographic writing in the text, where prosody, poetics, and line-by-line analysis often form the primary “meat” of analysis. In contrast to this, I wanted to focus in the book on the sound of the voice itself: what do different voices sound like, when they are speaking and singing? What is the timbre or tone color of a voice, its range, its speech style, dialectal and idiolectal inflections, and how is a voice affected by the body it inhabits? How do voices have their own agency, not just symbolically and politically, but also literally, when a voice is “thrown” into a room or sounds (and affects its listeners) in a particular way, and how are voices connected to Indigenous sovereignty? Also, how can we combine our analysis of both singing and speaking, and what productive and rich overlaps might we find by combining both uses of the vocal tract within the same frame? To me, sounds matter in the world. How someone else sounds—whether over the telephone, in person, in a radio interview or on television—affects me deeply and resonates in my ears and mind long afterwards. I wanted to capture some of this affective resonance not only through my ethnographic vignettes, but also through the analytic methods and tools used in the book. Morgan Siewert: Important to your book’s discussion on the complexities of authenticity and voice is jaan, defined initially as “the culturally intimate […] term for a working-class rube from the ‘sticks’” (4). You define jaan several times and in diverse ways throughout the book, demonstrating what you describe as a malleability that reveals “the slippages, or cracks, between worlds” (42). As I read your book, I came to understand the jaan figure as an example of how people become metonyms for attitudes about imperfect Navajoness, for “matter out of place” (33). Through “betwixt and between” figures such as the jaan, innovation in language and the expressive arts is both stigmatized as inauthentic Navajoness as well as valorized as privileged local knowledge. I find this discussion—which ranges from the jaan to Miss Navajo to politicians—to be the most challenging aspect of your book. I came away with a sense that modalities framed as the most inauthentic are, in practice, among the most authentic icons of Navajo experience and identity. In other words, being “matter out of place” is what anchors country music as an authentic Navajo expressive art form. How would you supplement or challenge this reading? Kristina Jacobsen: This is such a lovely and provocative question. I think your read that jaan becomes a refraction for how “imperfect Navajoness” circulates at the local level is spot-on; in my experience, these discussions of ideal Diné-ness occur almost constantly, in public and very performative spaces such as political campaigns and radio stations, but also at very intimate levels, among family members, over dinner, at the flea market, during family cattle roundups or even at the tribal veterinarian’s office. So yes, being “matter out of plaee” at some level makes something—songs or speech styles in this case—authentic in a way that is hard for others without this abjected cultural capital to touch. At the same time, the irony perhaps is that things deemed as “matter out of place,” such as country music dubbed as “rez” or “jaan,” are also profoundly in place and locally emplaced, so much so that even performing off-reservation is rarely an option for “rez bands.” So, rez country music is both matter out of place and completely sutured to place, at one and the same time. To add a bit more to this discussion: I also think that the whole idea of the jaan is a term that implies an outsider, non-Diné gaze looking in on Diné practices; in this way, jaan as a concept—in its stigmatizing and laudatory uses—sits in the crosshairs of settler colonialism, and perhaps could not even exist outside the setter colonial context and the ways in which Diné identity has been parsed, dissected, judged and quantified by Bureau of Indian Affairs Bureaucrats, anthropologists, missionaries and other entities. So, it’s the colonial gaze turned inward, with powerful repercussions. At the same time, there is innovation, both linguistic and musical, and this is one of the things I find so powerful: that even within a very narrowly constrained field of aesthetics and where the politics of authenticity almost always hold an upper hand, there are musicians, spoken word artists, poets and language users—among them Chucki Begay, Radmilla Cody, hip hop artist Def-I and improvisers like jazz trumpeter Delbert Anderson- who continue to carve their own path and express themselves assertively, gracefully, and with incredible power, through their chosen linguistic medium. Morgan Siewert: What is your next project? Kristina Jacobsen: My next ethnographic book project, Sing Me Back Home: Songwriting, Language Shift, and Italian Colonialism in Sardinia, focuses on country music, singer-songwriters and language shift on the island of Sardinia, Italy. As a touring country musician, singer songwriter and cultural anthropologist living in Sardinia for the past two summers, I have been captivated by the surprisingly rich Americana and country music scene. It struck me that the reasons were connected to Italian colonialism, and this led me to formulate my main question for this research: how do performances of American roots music by Sardinian musicians serve to secure a sense of connection to the island of Sardinia, and strengthen a sense of political and cultural separation from the Italian mainland on this semi-sovereign Mediterranean island? So, in Sardinia, I have begun writing songs with Sardinian songwriters in Sardinian (“Sardo”), English and Italian as a form of participant-observation to get at questions of language, sovereignty, identity and relationships to the Italian mainland (the “Continente”). Here, the process of songwriting itself forms part of the core research methodology, where writing a song with one’s interlocutors forms a powerful point of connection as a way toward deeper intercultural knowing that is both artistic and ethnographic. The second part of this project, therefore, will focus on recording ten cowritten songs for an album that will accompany the book, where I ethnographically document how language politics play out in microcosm in the space of the recording studio, and where the music and the book text are two interdependent parts central to my analysis of both sound and politics. I will be spending my sabbatical year in Sardinia, doing twelve months of ethnographic fieldwork toward this project, and living in the mountain village of Santu Lussurgiu. My dissertation examines how slam poets in Madagascar have forged a novel form of public discourse that emphasizes both freedom of speech and accountability for one’s speech. This illuminates broader questions about how speakers determine what kinds of speech are possible and appropriate in various contexts, how they perform authority, and how they anticipate and manage the consequences of their speech. Slam—a performance poetry competition created in Chicago in the 1980s—has become a popular social movement around the world, but in Madagascar it has flourished in a context that includes pre-colonial genres of verbal art that are central to everyday life and to politics. In many of these genres, public speech has long been reserved for elder men. Slam’s insistence on “free expression” thus constitutes a radical break from long-standing notions of the social roles and risks associated with public speech. Treating the concept of free speech as historically and contextually specific rather than abstract and generalizable, my dissertation shows how Malagasy slam poets balance liberal discourses of individual freedoms with notions of responsibility and accountability, dialogic authority, and embodied relationality. The excerpt below from page 99, then, is not particularly representative of the rest of the dissertation. It’s a bit of a historical interlude that sets up some of the core issues that I examine later in the chapter, so I return to these ideas about linguistic difference and language politics but without this level of historical detail. Most significantly, this excerpt stands out because it doesn’t reference any of my own fieldwork research, or even mention slam poetry at all. Most other sections are based around ethnographic vignettes, poems, and interviews. But this historical section is critical for understanding the heft and significance of contemporary language politics—the dominance of “official” Malagasy (based on the Merina dialect), and the sociopolitical valences of French versus English. This history is critical to understanding the imbrication of language and public speech with contemporary social inequalities and political and economic networks of power. In 1835, the Merina Kingdom’s reigning monarch, Queen Ranavalona I, began a violent campaign of repressing Malagasy Christians, prompting most missionaries to leave the island and bringing an end to the U.K.-Madagascar alliance forged by her predecessor and husband, King Radama I, and to the evangelization of the country. It also likely enabled the French colonization of Madagascar in 1894: with the British gone, France saw an opportunity to invade. They struck a deal with the British in 1890, in which they ceded Zanzibar in exchange for Madagascar. From a less-than-equal partnership with a foreign power, in which Britain had the military and economic advantage over Madagascar yet recognized the sovereignty of the Malagasy Kingdom, the nation was thrust into more than 70 years of forced labor, extreme poverty and famine, massacres, violent repression, racialized debasement, and cultural and linguistic subjugation. Hallie Wells. 2018. Moving Words, Managing Freedom: The Performance of Authority in Malagasy Slam Poetry. University of California, Phd. Ben Ale-Ebrahim: In Sounding Islam, one of your primary arguments is that anthropologists of religion should focus more attention on the importance of sound and sonic atmospheres in the study of embodied religion. What originally motivated you to focus this project on the role of sound in religious communities? Patrick Eisenlohr: In the recent material and media turn in the study of religion, the sonic tends to be rather marginal compared to work on the visual and visual cultures. But there is more to the focus on the sonic than merely redressing this obvious imbalance. There is, above all, the privileged link between the sonic and the emotive and affective. Saying this, I do not want to set up a binary contrast with the visual along the lines of what Jonathan Sterne has called a Christian “audio-visual litany.” But the privileged link of the sonic to the emotive and affective cannot easily be dismissed. This is because the sonic implicates the body, or to be precise, the felt-body, what is called the Leib in German, in a most comprehensive way, as sonic events can not only be registered by the hearing apparatus, but potentially the entire body, its flesh. In parts of sound studies, the sonic, vibrational phenomena that transmit energy through a medium in ways that very often extend beyond the acoustically perceivable, have been equated with affect. This ties into longstanding questions about the proverbial power of music to profoundly affect people in ways that often seem ineffable. Without attention to the sonic, the study of religion would be oddly incomplete. Finally, for anthropologists, the sonic, especially as atmospheric, is relevant for many other fields beyond religion. One only has to think of the present political moment, where powerful moods and felt currents are reshaping politics and public spheres across the world, while deliberation and appeals to enlightened self-interest seem so irrelevant in so many places. Ben Ale-Ebrahim: Throughout this book, you develop a theory of sonic atmospheres that accounts for the different socio-cultural factors that influence whether or not one’s body is likely to respond to a particular sonic stimulus, making a clear distinction between understandings of sound as affect versus atmosphere. For example, you describe how Mauritian Muslims of the Ahl-e Sunnat tradition respond to na‘t performance in a positive way, feeling as if they are transported to Medina by the sound, whereas Deobandi- or Salafi-oriented Mauritian Muslims respond to na‘t negatively and do not experience the same feelings or affective responses. Can you talk a bit more about why you chose to focus on the analytic of sonic atmospheres and how you anticipate this analytic being useful for the anthropological study of religion in other contexts? Patrick Eisenlohr: Thank you, I am glad you asked this question. Distinguishing atmospheres from affect is important. Unlike affect in the Deleuzian genealogy that dominates understandings of affect in anthropology, atmospheres do not categorically operate below the threshold of consciousness. They are also highly meaningful and not “autonomous” in Massumi’s sense, yet they speak to the same concerns about the movement of energy through and between bodies and the need to grasp what cannot be discursively specified as affect theory does. Atmospheres, whether sonic or in other modalities provide a bridge across the chasm that separates affect from sociocultural mediations and forms, therefore they are relevant to many other contexts that anthropologists study, far beyond what is commonly understood to be religion. To return to the example you just mentioned, sonic atmospheres, such as those generated by a voice, exert suggestions of movement on the felt-bodies of those they envelop. They do not just provoke feelings, seen from the vantage point of the neo-phenomenology of Hermann Schmitz such atmospheres themselves are feelings extended into space. But atmospheres can also be merely observed, as the Deobandis or Salafis you mentioned are likely to do, while the Ahl-e Sunnat devotee will probably be seized by them. By locating feelings outside human subjects, an analytic of atmospheres addresses the movement of energy between and through bodies, but also allows for sociocultural mediations to influence what stance subjects take to atmospheric forces, sonic or otherwise. Ben Ale-Ebrahim: I am fascinated by the spectrogram and waveform diagrams that you include in chapters five and six. You mention that you were motivated to include these partly as a result of your training in linguistic anthropology, where formal analysis is typically paired with discursive analysis. What was it like collecting these audio samples and working with this type of data? Can you talk a bit more about your methodology here? Patrick Eisenlohr: In order to do justice to sound as a separate mode of knowledge and meaning-making, it is important to provide other forms of access to it than discourse. This is one of the main reasons why I used the spectrograms. They give a different sense of the sonic dynamics and movements that make up na‘t recitation. Like discourse, these visual representations of sonic events also have inherent limits in coming to terms with the sonic. They captures sonic movements in a very striking way, but the movements in three-dimensional space they visualize are not the same as the suggestions of movement enacted by sonic movement from a phenomenological perspective. My interlocutors directed me to the parts of na‘t recitals they found most powerful and emotionally compelling, often expressing this through metaphors of travel and spatial displacement. I decided to complement their verbal descriptions of the power of a na‘t reciter’s voice with the perspective on auditory cultures they afford with the spectrograms and the analysis of pitch, volume, timbre, and reverb the spectrograms and waveforms allow. This was inseparable from the analysis of the technologically amplified, modified and reproduced voices, since most examples of what my interlocutors considered a particularly “moving” voice also included its media-technological shaping. Comparing the verbal description and formal analysis of vocal sound in this context helped me to make sense of one through the other in ways that an exclusive focus on either verbal characterization or the formal analysis of sonic events would not have allowed. Ben Ale-Ebrahim: You discuss how media play a very important role in the reception and performance of na’t throughout this book. 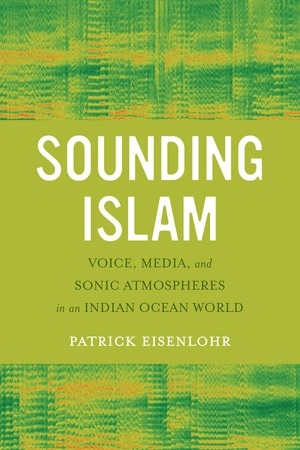 In chapter three, for example, you emphasize how small media like CDs, DVDs, and books work to enable transnational connections between Muslim communities in the Indian subcontinent and Mauritius. What changes have you observed over time in the way na‘t recordings are distributed and shared? Do social media outlets like Facebook and YouTube, or other internet-based platforms, play a significant role in na‘t performance communities today? Patrick Eisenlohr: The story is quite familiar. In the late 1990s, I still encountered the use of audiocassettes with na‘t collections, which were quickly supplanted by audio-CDs in the early 2000s, and finally by mp3 files in the last ten or twelve years. A newer phenomenon is the popularity of videos of na‘t recitals. Unlike in India, cheap low-grade video CDs never really played an important role in Mauritius, DVDs were more popular, and videos streamed via the internet on mobile devices have dominated in the last 7 to 8 years. In the meantime, social media like YouTube and Facebook have come to play a huge role, performances are not just routinely recorded but now also shared online. According to what my interlocutors have told me, the visits and live performances of Indian and Pakistani na‘t khwan played a decisive role in making the genre more popular in Mauritius, not just the availability of imported cassettes and audio-CDs. These visiting na‘t khwan in turn inspired the emergence Mauritian na‘t khwan. In at least one case, a Mauritian na‘t khwan got his first training by an Indian Imam residing in Mauritius at the time. These local na‘t khwan then started to produce and circulate their own collections of na‘t recordings. Ben Ale-Ebrahim: Many of the ethnographic examples you reference in this book are drawn from your discussions with amateur na’t performers living in Mauritius, such as Shareef and Nazeer. You discuss how they learn to perform na’t, imitating previously released recordings of famous na’t khwan in order to capture their unique ler or manner of vocal expression, for example, and describing the ways in which their behavior outside of performance spaces, such as their general level of piety and their reputation in the Mauritian Muslim community, affects their reception as professional performers of this particular style of religious music. I’m curious to hear more about what happened to your interlocutors, such as Shareef and Nazeer – did they end up “making it” and becoming professional na’t khwan? When does one break the barrier between amateur and professional in the world of na’t performance? Patrick Eisenlohr: None of my Mauritian na‘t khwan friends has become a professional in the strict sense of the word, for none of them is this their main occupation. Shareef is now the director of a primary school, Nazeer is retired, and Farhad is an Urdu teacher. Although they are justifiably proud of their na‘t recordings, they all say that they do not see themselves as a match for the Pakistani superstars. The latter are famous and make a good living from reciting na‘t. But for my Mauritian interlocutors there is also a certain ambiguity surrounding the superstars’ professional status, there is admiration for them, but there are also moral doubts about reciting na‘t for money, and not for the love of the Prophet alone. Doubts over whether such professionalism allows for the benefits a na‘t performance is supposed to bring about point to exactly the importance of perceived piety and personal reputation you have mentioned. Certainly, I heard my share of stories about what some perceived as the aloofness and the high financial demands of visiting professional na‘t khwan. Seen from such a perspective, “making it” as a professional also invites suspicions of moral corruption, and becoming a professional in the sense above may therefore be felt to be not entirely desirable.